*Product received for this review. Back in May, I brought you a giveaway from a wonderful company owned by a friend of mine, Personally Yours in the Totally Toddler giveaway hop!! Due to scheduling, sickness, etc...I did not actually have the shirt firsthand to fully review at the time. 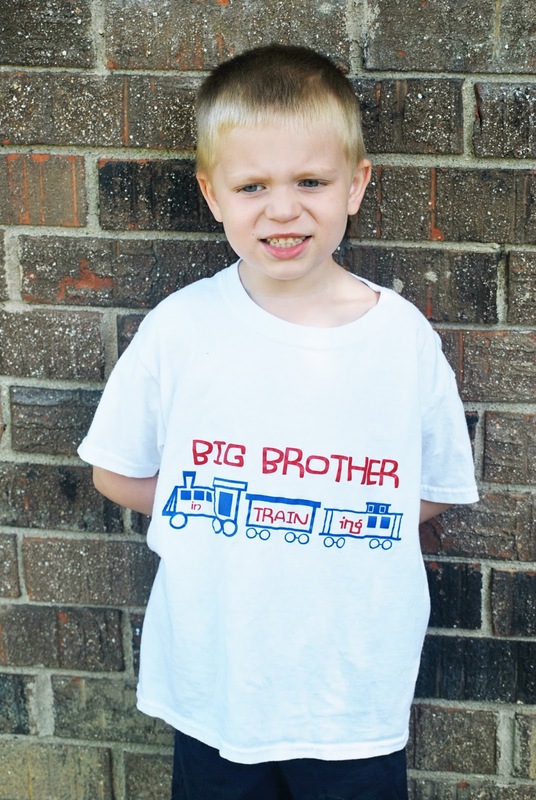 Now that we have it, I wanted to take a minute to share a few photos of my little man in his custom creation big brother t-shirt. Personally Yours is a wonderful little business ran by a friend of mine, Dory! She offers a little bit of everything- vinyls, t-shirts, sign, personalized gifts- she does it all! And everything is made to order, if you don't see something in her shop, just ask!! It's truly all about creating something special just for YOU! For this review, Dory created a custom shirt just for my little man. 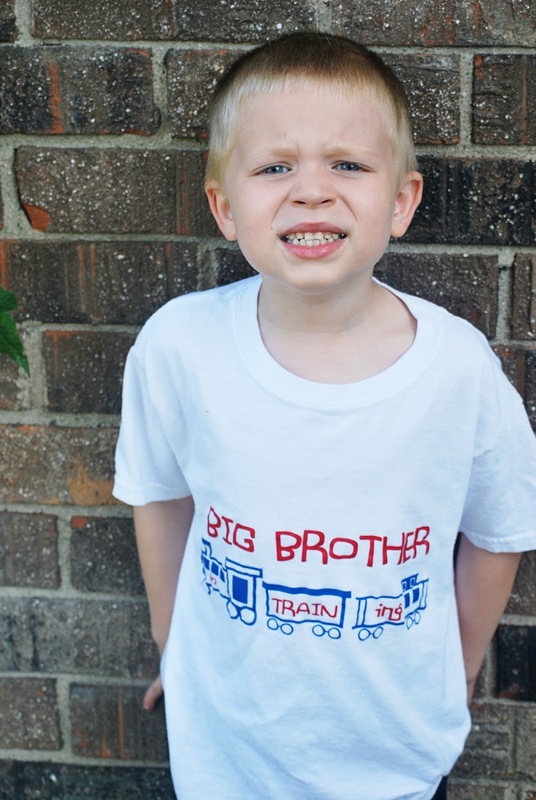 She incorporated his love of trains, and his favorite colors to create this adorable one-of-a-kind big brother t-shirt just for him. Shaun loves it just because it's all about trains...Mommy happens to love the fun play on words, 'Big Brother in TRAINing'...cute and clever! Dory is super creative and very easy to work with too...honestly, I just told her a little about Shaun's likes and that I wanted something to do with being a big brother...and the rest was all her creation!! The quality is wonderful too! Shaun has already worn his shirt several times and it has survived many washes!! (And a boy who is quite rough on clothes!) If you're looking for a unique design for your little one, or yourself...be sure to check out Personally Yours!! Aside from offering these adorable custom creations, Dory is also a fellow blogger! She writes a wonderful blog called The Doyle Dispatch where she writes about life, DIYing and everything in between. Be sure to check it out as well!! You won't be sorry!! Disclosure: I received the above mentioned product in exchange for my honest review. All thoughts and opinions are 100% my own!